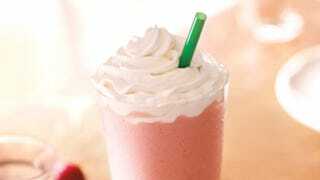 First Starbucks switched to cochineal extract, a food coloring made from ground up bugs, to satisfy the demands of people wanting more natural products used in their food. Then the vegans found out the company had opted for insects and freaked out. So now Starbucks has announced it has abandoned the bug juice and will now use lycopene, which is a "natural tomato-based extract." So, rest easy and consider your Strawberries and Creme Frappuccino, Strawberry Banana Smoothies free of smashed up wings and finely ground tiny legs. Also freshly on the safe list are Raspberry Swirl Cake, Birthday Cake Pop, Mini Donut with pink icing, and Red Velvet Whoopie Pie. So that just leaves all the sugar, calories, and other things to kill you and/or disgust you.